When I was in high school, I made a few bucks working at McDonald’s. And when I say a few bucks, I really mean a few bucks. When I started working there, I was making around $4 an hour. So it didn’t exactly go along ways. Some weeks I’m not sure I didn’t spend it all on gas getting to work… and maybe along with the amount of food I would eat while on breaks as a hungry teenage boy. One evening, I was hanging out with a couple of friends from work. We cruised the mall a bit, spent some money at the arcade. Then decided we needed to eat. So we decided to hit the drive through at work for a bite to eat and see if we were missing anything. So off we went. You know those moments when you get really giddy and just can’t stop laughing? Well, as we were waiting for the drive-through we had one of those moments. I suppose someone in the car said something silly, as teenage boys like to do, which just triggered us and we could not stop laughing. And it was uncontrollable. So as we are making our order and then proceeding to pick up our food, we are laughing like fools. I’m literally lying down in the backseat because my sides are killing me from laughing so hard. Our friends in the restaurant are looking at us like we’ve lost our minds. When I went into work the next day, those who had seen us the night before were asking me if I was drunk! I was sixteen at the time, and unlike many teens today, I had never tasted alcohol at that point in my life. I was just having a good time with some good friends and we were in a merry mood. Those types of moments are fun memories aren’t they. When you are with some good friends, where you can just be yourself, you can be silly, you can let the other side of you show that people may not normally see. I’m sure, whatever we were laughing about was incredibly silly, and if I had told my co-workers what it was, they would have rolled their eyes and confirmed we had indeed lost our minds. We need that kind of release now and again. 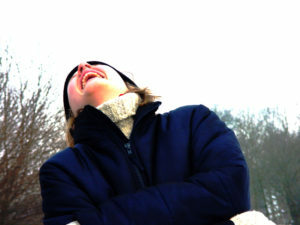 Boisterous laughter is actually pretty good exercise. Think about it. Your lungs get a good workout, your brain is engaged, your heart is pumping. Why do your sides hurt? Because you are using muscles, maybe more than you have for some time. I remember when I found a place to play basketball after we moved here. I hadn’t played basketball in a few years, and I certainly wasn’t in great shape. The day after my first night of playing, I could. Not. Move. My legs. Thankfully I don’t have that problem any more. I was using muscles I hadn’t been using for quite some time. When we use muscles in ways they haven’t been used for a while, they hurt. That’s a good sign actually. It means they are getting stronger. Too a point that is. Too much pain is a bad thing of course. Good side splitting laughter is good for our bodies. It works out some muscles we may not use too often. But it also lifts our spirits, hopefully at a time when we really need it. Which is why I’m not afraid to crack a joke at a funeral. There’s nothing wrong with tears, not at all. But sometimes we need a little laugh to break the tension and help us relax. So when I think about the disciples locked up in the house for fear of being discovered and punished by the authorities, I imagine things were tense at times. Sure they might be praying and remembering the stories of Jesus, but they would also be tense just wondering who might be coming to the door. Is it a friend or foe? Is it someone bringing dinner, or is it the Roman soldiers looking for their next crucifixion? Just think, every knock would cause everyone to jump. Every footstep outside the window would make one wonder is it just someone passing by, or is it a spy from the temple? There would be tense moments for sure. Then all of a sudden a loud rushing sound fills the whole house like a violent wind. And these things like tongues of fire appear and settle on each person in the room which causes them to speak in other languages. They were filled with the Holy Spirit, just as Jesus had promised them! Imagine the joy they felt at this moment. I don’t know about you, but when the Holy Spirit makes its presence known to me, it’s a powerful, joyful moment! And these guys have been waiting for this, although I’m sure they didn’t know when to expect it, nor did they know what it would do to them. The power of the Holy Spirit hit them with full force and I can just imagine them looking at each other and just laughing with joy because they realize Jesus has fulfilled yet another promise. And it’s far more than they ever expected. So they run out into the street, full of the joy of the Lord! And they start sharing the Good News of Jesus. The only problem is, they are speaking different languages. They probably don’t even know what they are saying themselves. But people in the streets are hearing them in their own languages, they are understanding what is being said and they want to know more. Some people… but not all. Some people thought they were drunk! And it was only 9 in the morning! At least when I went through the drive-through it was 9pm! The disciples were so overjoyed, so excited, so pumped up that they had received the Holy Spirit people thought they were drunk! And in a way, you could say they were! Being drunk is when your mind and body are altered by an abundance of alcohol or spirits. Your motor functions are inhibited as well as your cognitive abilities. In other words, you can’t walk straight and you can’t think straight. You don’t act as you normally act. So if we look at the disciples, they are running out of the house, talking funny, laughing, dancing, running up to everyone and telling them about Jesus. I guess you would think they are drunk, wouldn’t you? The disciples finally felt free from their prison. Not that they were locked up by the government, but the prison of anxiety and fear of being discovered. The Holy Spirit set them free. In other words, Paul wants us to get drunk. But not drunk on wine or beer or alcoholic spirits. He wants us to get drunk on the Holy Spirit. He wants us to be full of Jesus and sing praises to him all day long. Just like the disciples came running out of that house full of the love of God given to them by the Holy Spirit. And they were sharing from their hearts because the Holy Spirit, the essence of God, came into their hearts. What a beautiful moment this is for the church. God releases his full love, his full power into those who love Jesus Christ, and the world changes in that moment. No longer are people waiting on God to act, no longer are they following Jesus down the roads just waiting to see what miracle he’s going to do next… the disciples have the full power of God at their disposal, personally in their lives in the name of Jesus Christ our Lord. Don’t understand what I mean? Look ahead to what the disciples do. They perform miracles, they heal people, they teach people about Jesus and the love of God, they do just as they had seen Jesus doing. Peter, in the midst of the chaos of God’s Spirit spreading through the city, notices those who say they are drunk. And so he begins to preach. He actually quotes from the prophet Joel in the Old Testament to open his sermon. In other words, Peter is telling the crowd what has happened. He’s telling people, on this day, in this city, God has poured out his Holy Spirit on his children. And this Spirit, this joy they have in this very moment is available to anyone who calls on the name of the Lord. Peter goes on to preach and tell of the story of Jesus and how he is the promised one of God who has come and died and lives again. And when Peter finishes preaching, 3000 people were baptized and joined the church. 3000 people after just one sermon, the first sermon, saved just like that! I’d be happy if just one person responded like that once in a while! Truth be told, when the Holy Spirit shows up, it’s near impossible to resist. I’ve witnessed times when the Holy Spirit’s presence was so evident, people were speechless. Literally could not speak. Musicians were unable to perform because they were so overwhelmed they couldn’t see their music through the tears of joy. I know there’s been times when I’ve been speechless, although I’m sure a lot of Sunday mornings you’d find that hard to believe. That’s pretty much all you’re capable of, because God’s Holy Spirit just overwhelms you. I haven’t even touched our reading from Philippians 4 yet. But in this passage Paul is reminding us of how to live in the Spirit of God. So I’m simply going to close by letting the words of Paul in his letter to the Philippians resonate in our hearts. We thank you Jesus for yet another promise fulfilled. You have shared with us a most precious gift, the gift of your Holy Spirit, our companion, our guide, our comforter and our connection to you and our Father in heaven. This Spirit overwhelms us with your love and we give thanks. We have felt it in this church a number of times, and we know it is available to us even today. Your Spirit is always with us, and like the warmth of the sun, there are some days when we feel it a little more than others. So we ask you to again warm our hearts with this Spirit of truth and love, so that we may be moved to rush out into the streets and tell people of this wonderful gift singing your praises from our hearts. Jesus, we ask you to do this in your powerful name, so we may be a witness of your great love to a community, who loves other idols, and may we draw them into the joy of knowing you. May your Spirit fill us, may we become intoxicated with your powerful love in our hearts, and may we always sing your praises. We ask this in your most Holy Name. Amen and amen.